Home » Philanthropy » Robert Sidaway (1758-1809) and Mary Marshall (1756-1849) Sydney’s first philanthropists? Robert Sidaway (1758-1809) and Mary Marshall (1756-1849) Sydney’s first philanthropists? one of the first inhabitants of this Colony; during his very long residence in which he ever supported the reputation of a true philanthropist, and in all other respects a valuable member of society, in which he was universally respected. In 1782, Robert had been convicted of theft and later of absconding from custody and was sentenced to transportation to NSW for life. He travelled on the Friendship as part of the First Fleet and was regarded as troublesome spending some time on the journey in irons. He received an absolute pardon on 27 September 1794. Robert was awarded a contract to be a baker for the troops and also received a liquor license so that he could run a public house. 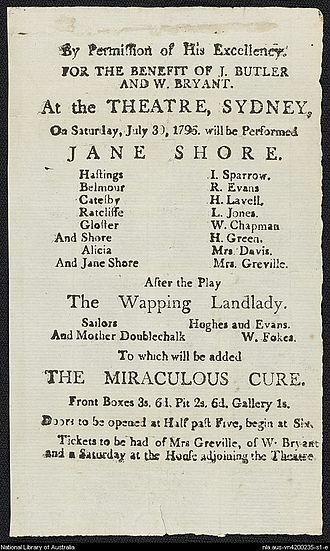 In 1796, he was operating the first theatre in Sydney which was eventually closed by the Governor as it was considered a corrupting influence. At this time, he also had a farm at the Field of Mars where he grew maize and wheat. From very early in his time in the colony, at least from November 1789 when they worked together in Robert’s bake-house, Robert had been living with ‘Mrs’ Mary Marshall (1756-1849) and she had become his common-law wife. In 1788, Mary had come as a convict in the First Fleet on the Lady Penrhyn having been convicted for stealing linen handkerchiefs in 1787 and sentenced to seven years transportation. It appears that, with Mary’s assistance, Robert had managed to quickly establish himself within colonial life and was moderately well off and prosperous for, by 1797, he was said to have accumulated more than £3,000. The wording of his death notice, designating Robert as a ‘philanthropist’, seems to indicate at least two things. Firstly, that he had a reputation as a philanthropist. The community view was that his philanthropy was not related to a single event, but that it was an attitude and activity over the considerable period of his time of residence in the colony. Secondly, that he was thought of as a ‘true’ philanthropist. This suggests that his philanthropy was regarded as genuine and not an activity with any ulterior motive. His philanthropy, together with that of Mary, could not have been expressed through any charitable organisation such as the Benevolent Society which only began in 1813, but must have been through their personal dealings. What other philanthropic activities Robert and Mary engaged in, for the newspaper recognised the role of Mary as well as that of Robert, is unknown, but their care of Elizabeth Mann, which would have been difficult and to a large degree thankless was, in itself, enough to cause them to be regarded as philanthropists by their community. Sydney Gazette and New South Wales Advertiser (Sydney, NSW), October 15, 1809, 2. Vivienne Parsons, ‘Sidaway, Robert (1758–1809)’, Australian Dictionary of Biography, National Centre of Biography, Australian National University, http://adb.anu.edu.au/biography/sidaway-robert-2660/text3681, published first in hardcopy 1967, accessed online 16 November 2016. Sydney Gazette and New South Wales Advertiser (Sydney, NSW), October 27, 1805, 1. On Robert’s death she was granted Letters of Administration of Robert’s Estate. Sydney Gazette and New South Wales Advertiser (Sydney, NSW), December 31, 1809, 1. Mary died aged 92 in Concord on April 29, 1849. The Maitland Mercury and Hunter River General Advertiser (Maitland, NSW), May 5, 1849, 3. Sydney Gazette and New South Wales Advertiser (Sydney, NSW), October 5, 1806, 2. Sydney Gazette and New South Wales Advertiser (Sydney, NSW), October 27, 1805, 1. 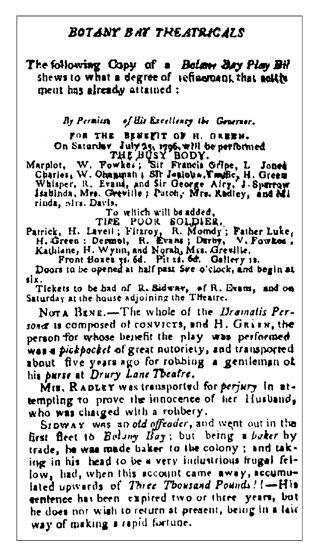 That the plays in the theatre were often for the benefit of various individuals is perhaps philanthropic on the part of Sidaway but Robert Jordan, The Convict Theatres of Early Australia, 1788-1840 says that nothing is known of the beneficiaries of the event. It was a common practice for a performance to be a benefit for an individual connected with the play house. Why the individuals received the benefit or how they were chosen is unknown. By phinaucohi in Philanthropy on December 5, 2016 .